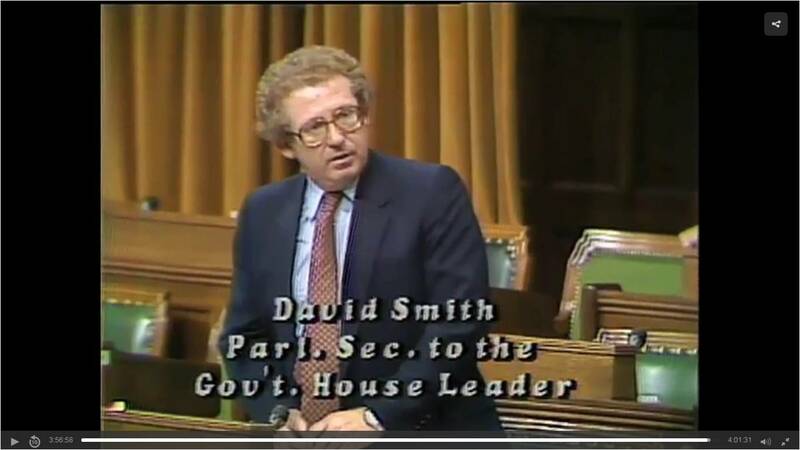 CPAC has recently done Canadians a great public service by uploading all the video footage of the proceedings of the House of Commons from its debut in October 1977 to present. As such, we can now see for ourselves how the Liberals purged Dominion Day from our history. The damage begins at 3:55 in this video chronicling the proceedings from 9 July 1982. The video shows what the Debates do not record: namely, the haplessness of Deputy Speaker Lloyd Francis (Liberal MP for Ottawa-West), who didn’t seem to understand how to preside over the proceedings and simply parroted whatever the clerk whispered to him. Incidentally, Standing Order 28(1) of the House of Commons still refers to the holiday on 1 July as “Dominion Day.” I wouldn’t be surprised if the Trudeau II government introduced a motion to the Procedure and House Affairs Committee to scrub that overlooked vestige of Dominion Day from history, too. The other two vestiges of the Dominion of Canada that have escaped notice are the Dominion Sculptor and the Dominion Carillonneur. Here is my summary and critique of the Liberals’ parliamentary subterfuge of 9 July 1982 from my article “Lament for a Dominion,” which appeared in The Dorchester Review in 2015. Some Liberal and New Democratic backbenchers mounted their final assault against Dominion Day on 9 July 1982, at 4:30 on that Friday afternoon, when thirteen MPs rammed the bill through Second Reading, Committee, Report, and Third Reading in mere minutes in order to change the name of Canada’s national day from Dominion Day to Canada Day – all without the quorum of 20 members mandated by section 48 of the British North America Act, 1867. The official transcript of this incident takes up only one page’s worth of space in the Commons Debates, and the House immediately adjourned thereafter. Worse still, Speaker Sauve let the Deputy Speaker’s knavish tricks stand and thus defied section 48 of the British North America Act. Liberal MP Hal Herbert moved that Bill C-201 be given Second Reading and referred to its corresponding Standing Committee, and the Deputy Speaker agreed. The bill moved through the House of Commons with such haste that it caught the Conservative MP for Nepean-Carleton, David Baker, off guard. The transcript shows that he asked, “What is going on?” just before the Deputy Speaker asked for the unanimous consent of the House that the bill be dealt with by the Committee of the Whole His question went unanswered. David Smith, then a Liberal MP and between 2002 and 2016 a Liberal Senator Senate Liberal, rose on a point of order in favour of passing the bill. Liberal MP for Ottawa-West, Cyril Lloyd Francis, chaired the Committee of the Whole and passed the bill: “Clause 1 agreed to. Preamble agreed to. Title agreed to. Bill reported, read the third time and passed.” After participating in this charade and mockery of the parliamentary process, New Democratic MP Mark Rose proudly proclaimed, “I think this is a day on which to develop and to celebrate our new holiday. It is only appropriate that, in celebrating our new holiday called Canada Day, we should at least take a holiday of 55 minutes for the afternoon” — as if the Senate did not first need to approve the bill, or the Governor General give it Royal Assent. All had transpired in a few minutes — the transcript of this incident takes up only one page (p. 19201) in the Commons Debates — with the concurrence of the Deputy Speaker, Lloyd Francis. Worse still, rather than reverse her deputy’s knavish tricks owing to a lack of quorum required by section 48, Speaker Jeanne Sauvé let the change stand. In his triumphalism, Rose brazenly glossed over the parliamentary coup d’état in which he had just participated. In fact the House of Commons acted unconstitutionally and did not validly pass this bill, because section 48 mandates that a quorum in the House of Commons is 20, not 13: “The Presence of at least Twenty Members of the House of Commons shall be necessary to constitute a Meeting of the House for the Exercise of its Powers, and for that Purpose the Speaker shall be reckoned as a Member.” For example, later in the same year, on November 16, having failed to reach a quorum even after ringing the bells to summon more Members, the Speaker adjourned the House (Debates, p. 20729). For this reason alone, the bill should not have regarded as legitimately passed onto the Senate, and the Senate should have rejected it. In addition, this private member’s bill was not, and could not have been construed as, a matter of confidence in the Trudeau government, so rejecting it would not have threatened the government’s parliamentary position. One argument is that Speaker Jeanne Sauvé ultimately should have allowed the debate to stand despite the fact that the Commons fell short of its constitutionally-mandate quorum of 20 MPs because none of the MPs present during the debate protested the lack of quorum. This argument is flawed for two reasons. First and most fundamentally, the Constitution of Canada is the supreme law of the land, and though the House of Commons has the authority to control its own internal affairs, its Standing Orders must conform to the Constitution. If the Standing Orders and the Constitution come into conflict, the Constitution must prevail to the extent of the inconsistency. Second, David Baker probably would have objected at the time if he had grasped the significance of the parliamentary usurpation that his colleagues were in the middle of orchestrating. Conservative Senator David Walker noted that the House of Commons passed the bill with only 13 members and “to make sure that the bill slipped through, a member asked for ‘unanimous consent that the clock now read five o’clock’” so that the House adjourned immediately after passing the bill, thus precluding any further objections to it that day. Since the House of Commons failed to uphold the Constitution, the Senate should have done so by rejecting the bill. Canada. House of Commons, Debates, 32nd Parliament, 1st Session (9 July 1982) at 19201 (David Baker). Canada. Senate, Debates, 32nd Parliament, 1st Session (3 August 1982) at 4744 (David Walker).